Attention! Two books on page bellow! Vladimir Dmitriev was born 19th of July 1923 in Penza in family of teachers. After some years family have moved to city of Tambov where Vladimir Dmitriev has started to study in musical school on a piano class, and then in the Tambov musical college. Vladimir Dmitriev studied in Lydia Umyotskaya's class (student of S. Rahmaninov and A. Ziloti). Dmitriev's piano playing was marked also by the often commissions coming on examinations from Moscow. When war began, Vladimir Dmitriev together with the brother (the musician too) were called up for military service, they have defined in the Tambov infantry school. While the front approached to Tambov, infantry school, as well as other military formations, prepared for defense. German approach was stopped. Then this school was relocated to Central Asia (up to the end of war). In school, having found out, that Vladimir Dmitriev - the pianist, have charged him to head amateur performances, and then to lead the songs and dancing ensemble, the first trials concern to this time in the composition of music also. Then interest to an accordion becoming his beloved instrument for many years was showed also. After the war Vladimir Dmitriev worked in Tambov. In 1947 he comes to Leningrad and becomes the soloist in a jazz band of a cinema "Aurora". It is necessary to tell, that after war huge popularity was received with film-jazzes - the cinema became the most popular concert stage which drew to itself thousands people. Concerts at cinemas began 30 minutes prior to display of a film, and frequently people came not on cinema, but on a concert before film. The jazz band of the cinema "Aurora" was the best in Leningrad. In the beginning of 50th Vladimir Dmitriev has created one of the first in the USSR of variety quartets (accordion, clarinet, guitar, contrabass) which quickly became popular ensemble in Leningrad. From middle of 50th years the quartet begins to go on tours on all country with solo programs and accompanying the best singers of Leningrad. The geography of performances covered all country: from Vilnius, Riga up to Kamchatka and from Murmansk up to Tbilisi, Baku and Yerevan. That time has appeared many records of the quartet. 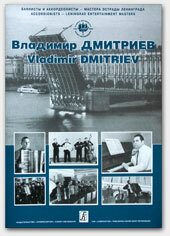 The quartet and its head Vladimir Dmitriev became popular in the USSR. As the soloist-virtuoso the best variety and jazz orchestras of the country began to invite Vladimir Dmitriev. He was invited to Moscow to a permanent job in L. Utiosov orchestra, in Eddy Rozner jazz, in a variety-symphonic orchestra of Ail-Union radio and TV, but Vladimir Dmitriev was the real patriot of the city and the quartet. In 1958 the quartet has received a rank of the Winner of the All-Russia competition of variety performers. Playing of a quartet was recognizable at once: technical shine, flexible phrasing, and also special Leningrad style - intelligence, taste, ease, elegance of playing (even in the most masterly places), a beautiful sound, a huge range of dynamic shades. Vladimir Dmitriev's playing amazed many fans and professionals. The quartet one of the first in the country began to go on tour abroad. Vladimir Dmitriev has composed many instrumental pieces for a quartet, made arrangements for an orchestra. From middle of 50th years he has tried himself as the composer, and his songs have begun to sound on radio and TV. At the end of 50th beginning of 60th years his songs were performed by known Leningrad singers: Z. Vinogradova, V. Beszenny, V. Kopylov, V. Matusov, G. Jukhina, M. Pakhomenko, II. Hil', L Senchina. In 60-70th years his songs have obtained a national recognition and popularity. They were performed by the best singers and collectives of the country: L. Barashkov, V. Tolkunova, O. Lundstrem's jazz, ensemble "Melodia" under conducting G. Garanjana, singers of Romania, Yugoslavia, Germany, Bulgaria, USA. Vladimir Dmitriev cooperated with known poets: R. Rozhdestvensky, M. Pljatskovsky, M. Tanich etc. V.Dmitriev's songs were awarded with a rank of the Winner at telecompetition "Song of the Year" in 1971, 1973 and 1978. Being engaged composing creativity, V. Dmitriev nevertheless did not forget also an accordion: since 1964. during many years musical collections in a series "Happy Accordion" were published. From the beginning of 70th years the new stage began from Vladimir Dmitriev's creativity. He began to write music to television and animated films; the first musical "The Casual Witness" (1970). then musicals "The Night stranger" (1971), "Odessa's Estuary" (1975), "White Nights" has appeared. But the most known were musicals "The Long-liver" and "The Russian Secret", were produced by almost all theatres of light opera of the country (about 60 theatres). Vladimir Dmitriev has died 16"' of March, 1979. Since that time decades have passed, however Vladimir Dmitriev's music sounds today: singers perform his songs, theatres produce his musicals, several generations of accordionists study in elements of variety art on his instrumental compositions.